From left, Commissioner David Painter; Phil Baldauf, USDA APHIS; Jeff and Jill Connor; ODA Director David Daniels. REYNOLDSBURG, Ohio (March 15, 2018) – The Ohio Department of Agriculture (ODA) in collaboration with the U.S. Department of Agriculture Animal and Plant Health Service (USDA APHIS) today announced that Batavia and Stonelick townships in Clermont County are free from the invasive Asian longhorned beetle (ALB). 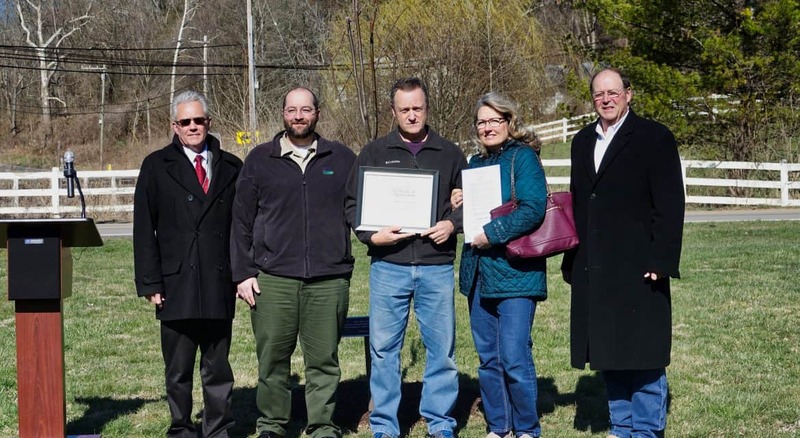 Daniels was joined by USDA APHIS representatives, as well as community leaders at an announcement ceremony and tree planting at the Clermont County Sheriff’s Office, an area contained within the previous Batavia and Stonelick quarantine area. ODA and USDA APHIS will move to lift the quarantine of Stonelick and Batavia townships, reducing the regulated areas of Clermont County from 62 to 57 square miles. The beetle was first discovered in Tate Township in Clermont County in June 2011. ALB quarantines remain in effect for Tate Township, East Fork State Park, portions of the East Fork Wildlife Area and a portion of Monroe Township. Adult ALBs are large, shiny black insects measuring 1 to 1 ½ inches long, not including antennae, with random white spots. Their white-banded antennae can be as long as the body itself on females and almost twice the body length on males. Signs of infestation include perfectly round exit holes (about 3/8 to 1/2 inch in diameter) made by adult beetles when they emerge from trees; pockmarks on tree trunks and branches where female beetles deposit eggs; frass (wood shavings and saw dust) produced by larvae feeding and tunneling; early fall coloration of leaves or dead branches; and running sap produced by the tree at the egg laying sites or in response to larval tunneling. The beetle will infest various common trees in Ohio, including all species of maple, buckeye, willow and elm. To report signs or symptoms of ALB, call the Ohio ALB Eradication Program Office at 513-381-7180 or report online at asianlonghornedbeetle.com.